"Castle Fraser, Scotland - July 2012: Two knights clash before the audience at a jousting re-enactment during a medieval fair. One of Santa Clarita’s newest venues for family fun is bringing a new and unique event to the SCV. The community is invited to Gilchrist Farm’s Summer Faire, a day to step back in time to the Renaissance, with jousting exhibitions, archery, magicians, storytellers and a lot more. Partnering with the American Jousting Alliance, Jim and Monica Gilchrist will open their 15-acre property on Saturday, June 3 from 10 a.m.-7 p.m. for a ticketed event that includes interactive activities from archery to sling shots. 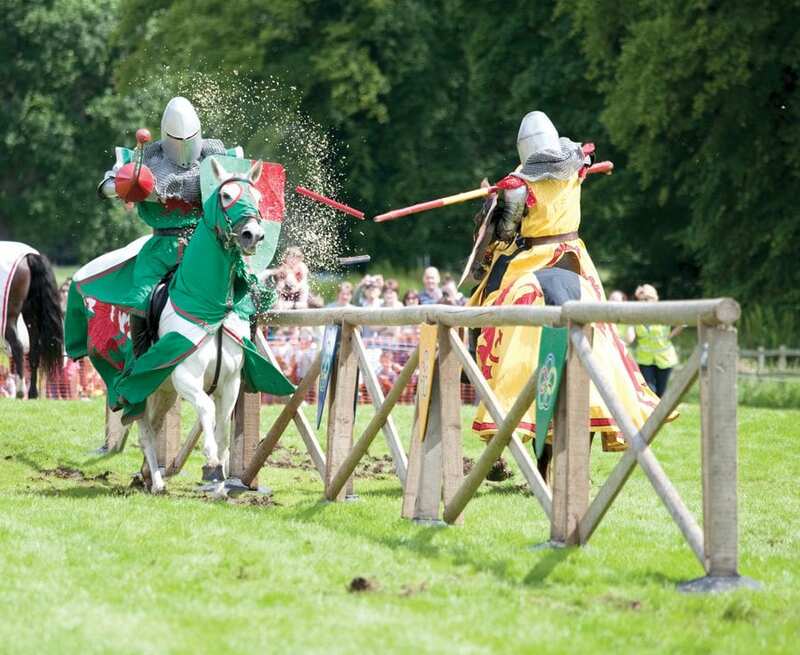 In addition to two jousting shows—at 1 p.m. and again at 5 p.m.—tickets include free entertainment: storytelling, magicians, musicians, archery, spears, sling shots, western roping and more. Other activities will be available for purchase at the Summer Faire, including pony rides and a renaissance mercantile with crafts for the kids, where they can create shields, pendants, goblets and other accoutrements from the middle ages. The Saturday wagon ride will also be themed and include narration. On Saturdays, Gilchrist Farm is open to the public from 9 a.m.-2 p.m. for pony rides, a petting zoo and farm-oriented crafts such as painting horseshoes, making candles, etc. There is a goat milking demonstration at 9 a.m. on Saturdays, and there is no admission fee; you just pay per activity. You may purchase tickets for the Summer Faire online at Gilchristfarm.com/a-summer-faire/, or you may go in person on Saturday between 9 a.m. and 2 p.m., or by arrangement. Pre-sale tickets are $22 for adults and $12 for youth ages 5-14. Groups of 10 or more get $5 off every ticket. Tickets at the door are $25 for adults and $15 for youth. Children 4 and younger are free with a paid adult. Gilchrist Farm is located at 30116 Bouquet Canyon Road in Saugus. Call 661.645.2517 or visit GilchristFarm.com.